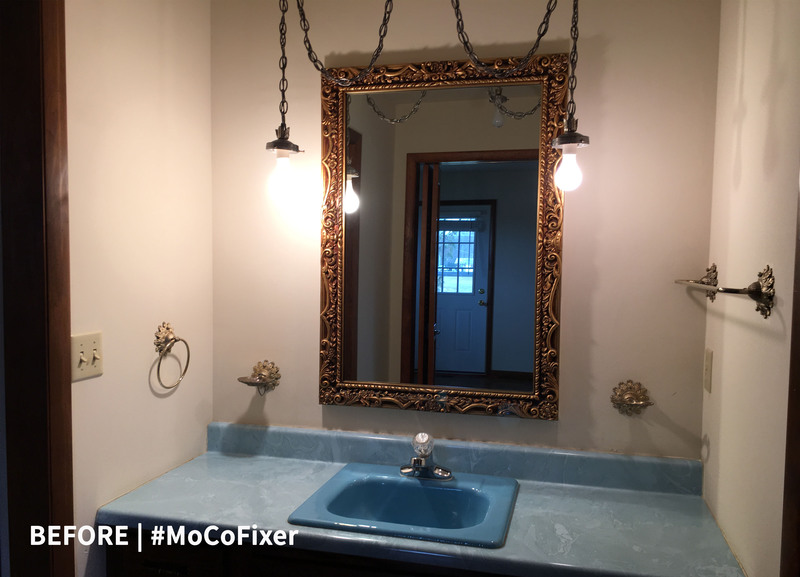 I’m back with another installment of #MoCoFixer before and afters! 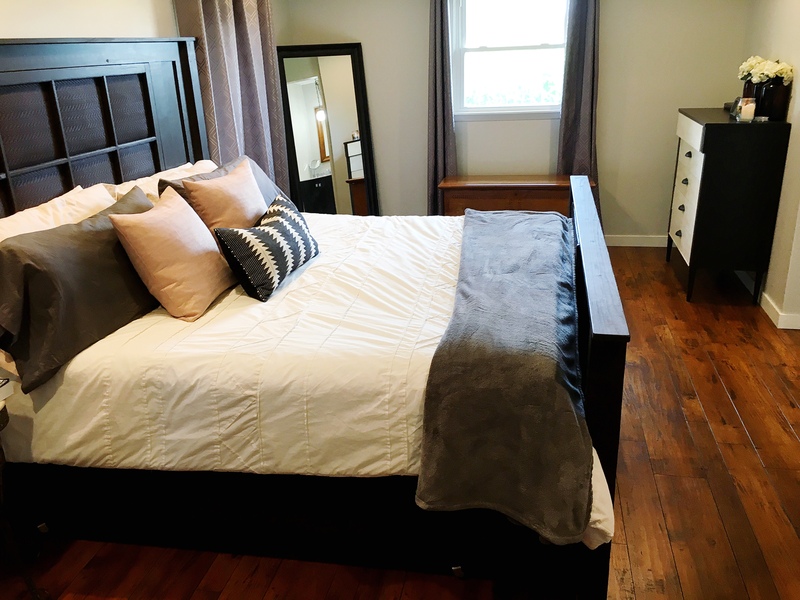 Today is all about our master suite, solely because I cleaned and it was suitable for photos. 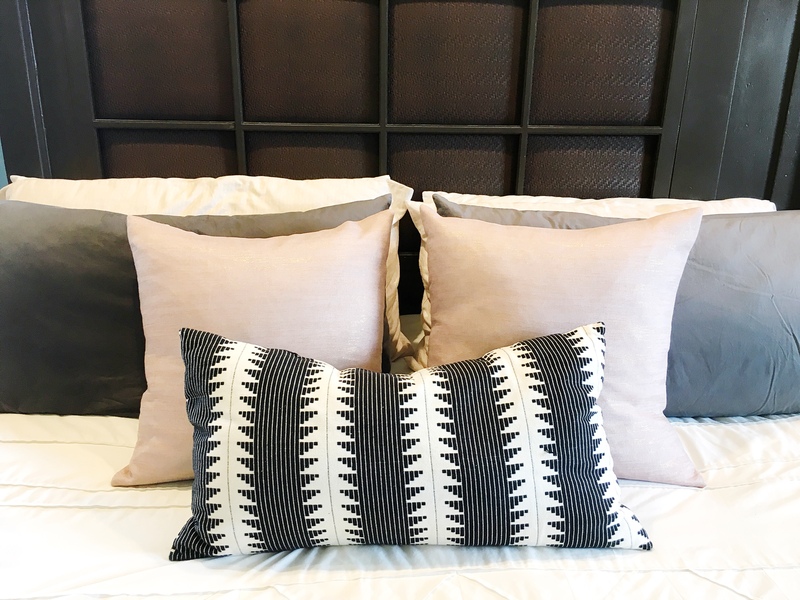 Our master suite has a few design challenges. First, at some point a door was installed where a window was originally. 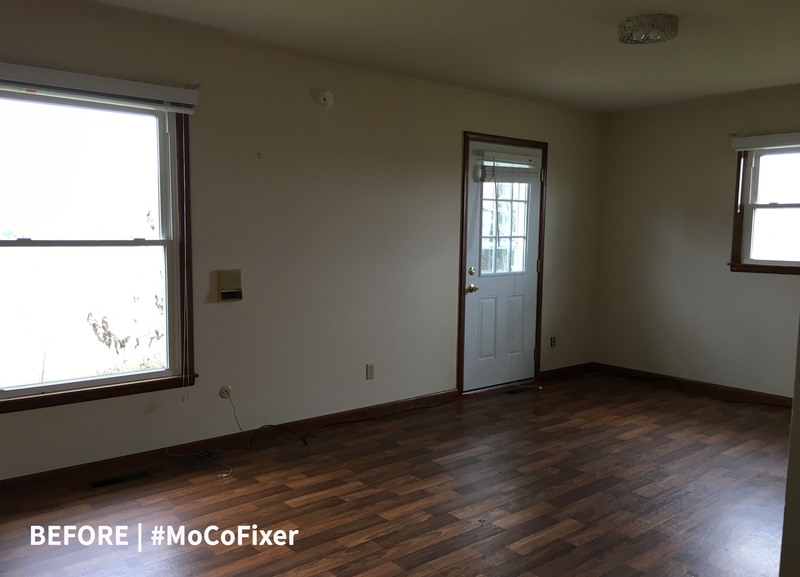 The former owners were elderly, so it makes sense that they would want another exit in case of an emergency. However, I really wish it was still a window. Someday, when we’re able to start #MoCoFixer’s exterior renovation, hopefully this is something we can address. But, for right now, I hung curtains above the door and called it a day. When they’re closed, you have no idea its a door and not a window. Secondly, the master suite only had one small overhead light. We made the decision early on to install new lighting throughout the whole house. So, in the master alone, we added six new can lights and two reading lights over the bed. The lights have made a HUGE difference! The wall above my desk area is still blank, mostly because I’m not sure what to do there. That pretty abstract art and the “C” are part of the plan, but I’m just not sure what else I want to use in the collage. Also, don’t be fooled. My desk NEVER looks that organized (as I crop out piles of papers and random stuff from the background). 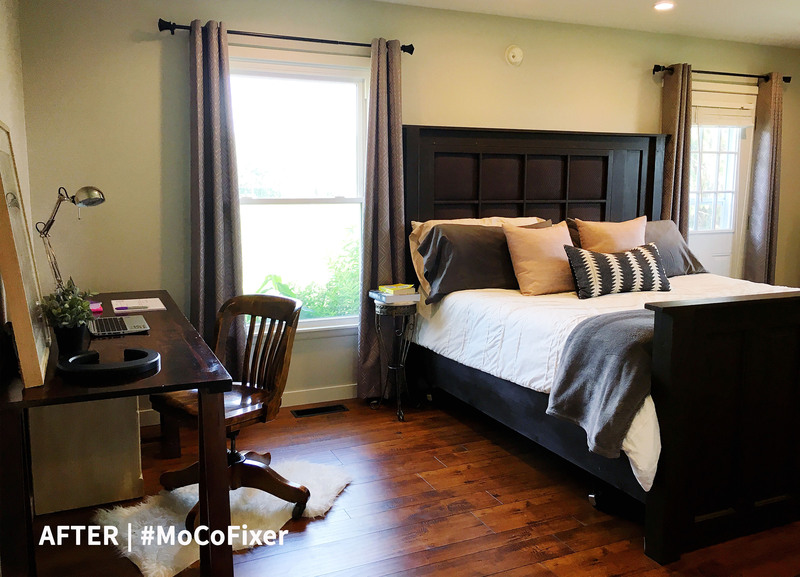 #MoCoFixer generally sticks to a black, gray, white and wood color scheme. However, in our master, I wanted to incorporate a hint of color through accessories. Somehow I got Mr. Cotten to agree to blush pink accents, and I’m running with it before he can change his mind. 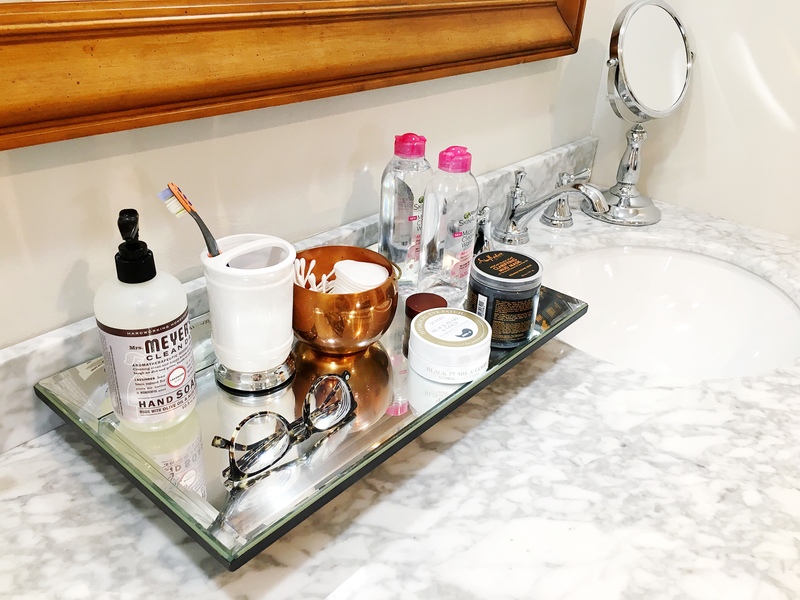 Of course, our bedroom is connected to our master bathroom. 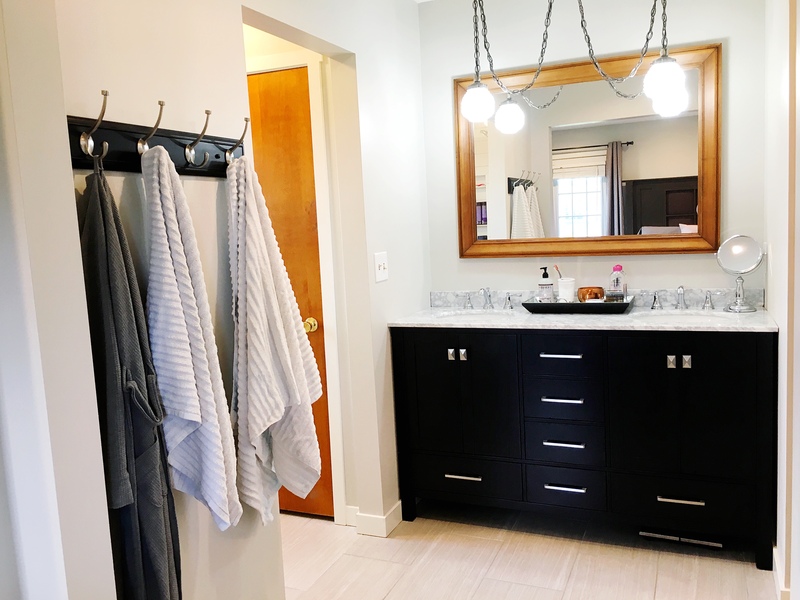 This bathroom gave us all sorts of trouble during renovation, but it now gives me all the heart eyes. For example, when the (heavy, very expensive) vanity was installed the (REAL) marble top broke. Like, a huge chunk just broke off the corner. So ANOTHER (heavy, very expensive) vanity had to be ordered, and then we had to do some grinding on the (REAL) marble top to make it fit in a space with walls that aren’t quite straight. I didn’t know broken marble could make me feel nauseous. But it did. 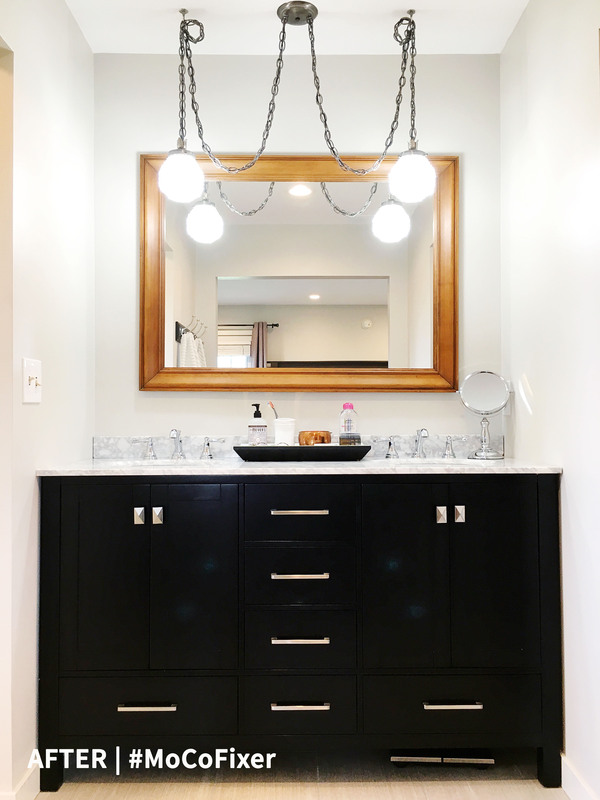 I searched far and wide for a ceiling mount light fixture for above the vanity, with no luck. Then my mom found these vintage crystal globes for $3 at a local thrift store, and I have never been more in love with a swag light. 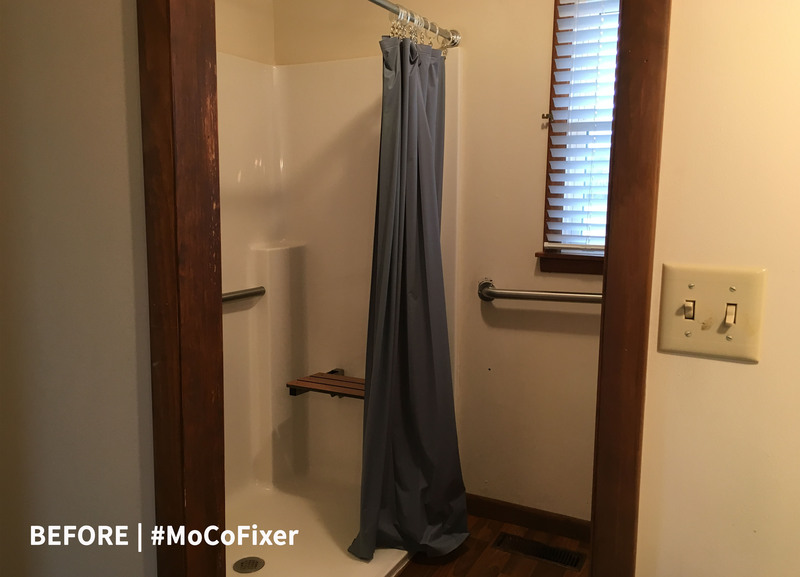 Perhaps my favorite part of all of #MoCoFixer is my new shower. We decided to keep the “handicap” shower instead of putting in a shower/bath combination. I love my bubble baths, but my spa-like shower is just as good in my opinion. I went with oversized white subway tile and medium gray grout on the walls, floor to ceiling. For the floor I chose a marble hexagon tile, and added a marble subway tile border. 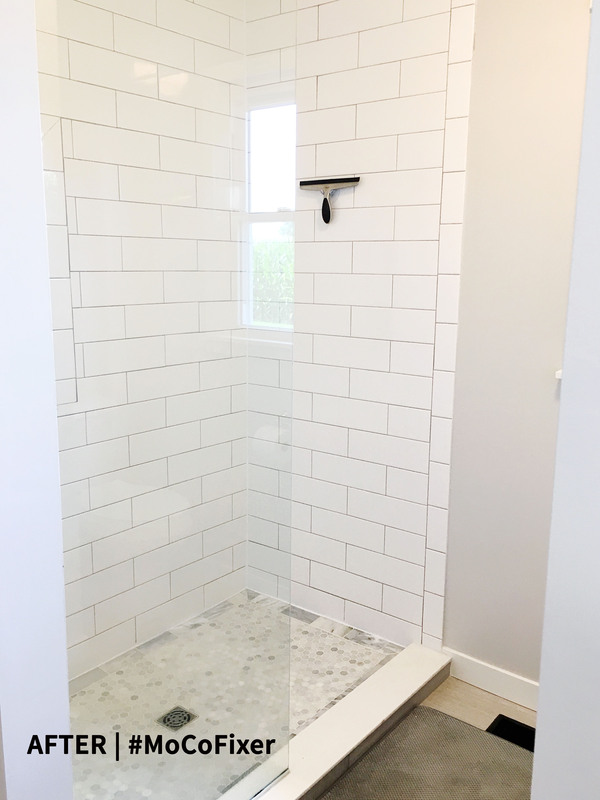 We then custom-ordered a piece of glass to serve as our “shower curtain,” and create a walk-in shower. Yes, water still gets on the floor. It’s a small price to pay. I also have a decently-sized, walk-in closet. 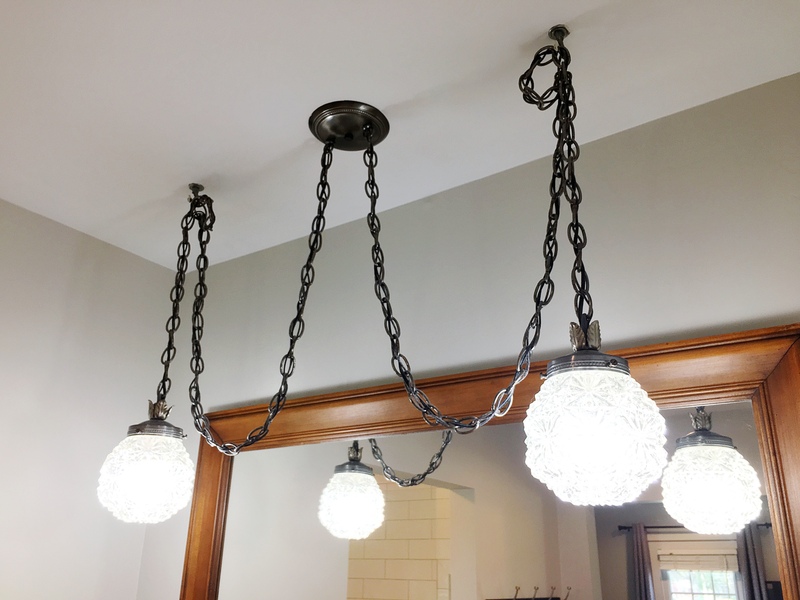 We decided to take the original crystal chandelier that was hanging in the dining room, and add a bit of glam to the closet. So, if you’re keeping track, we have now kept two of the original lights from the house (see! we’re not removing all the 1970s charm!). 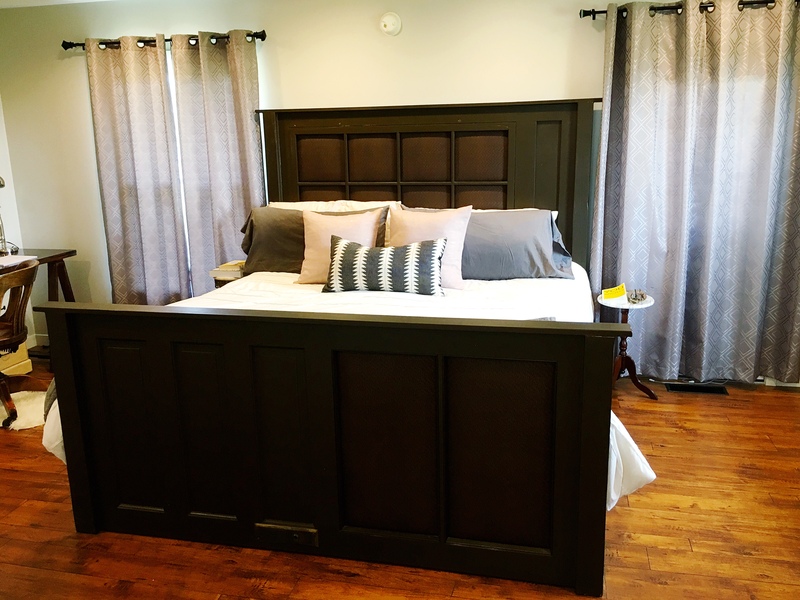 The master suite is one of the only rooms not 100 percent finished. Currently, we don’t have a door between the bedroom and bathroom. It works out fine, but it’s not exactly ideal when someone needs to use the bathroom in the middle of the night. 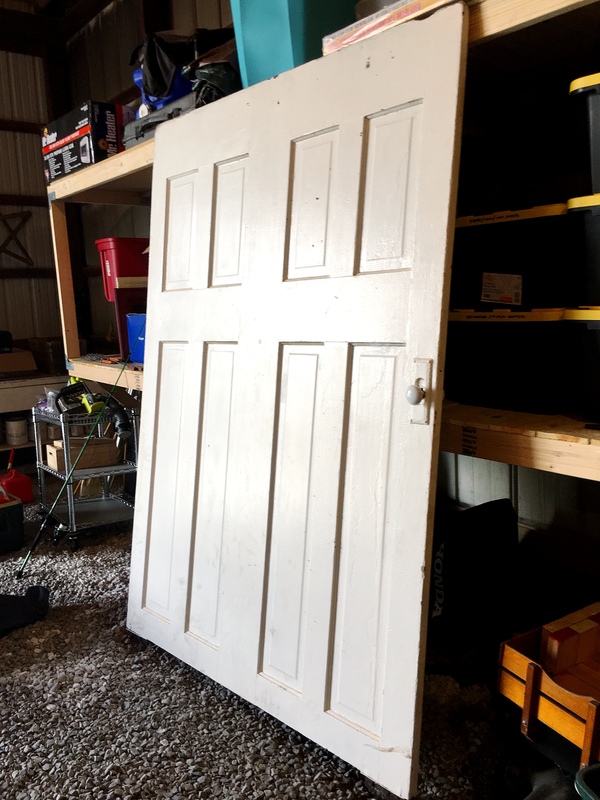 We have a HUGE antique pocket door that we got from an old local farmhouse that we are planning to hang like a barn door, but that would require finding time to sand, paint and hang it. Someday! It will happen! Suggestions on what color to paint the pocket door would be appreciated. White? Black? A color? I still cant believe the difference…..